Eden is the latest student to undertake the Book 1 Recital/Celebration Challenge. She is easily the best “Old Piece Reviewer” in my violn studio. So in this particular instance, the music making was no problem. It’s always fun when this is the case because then the focus of the evening becomes the food. Music was scheduled to begin at 6:30 but Eden likes to bake and wanted to help me out in the kitchen in making the dessert. So I arrived at 5:00 with all of the ingredients for her requested strawberry shortcake, of course all from scratch. 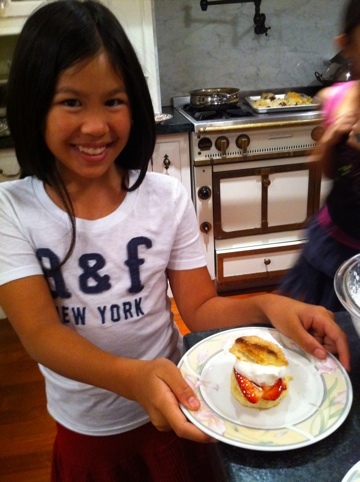 Eden had seen pictures from a previous recital where I had made strawberry shortcake and was very excited. Usually I base my shortcake on a recipe from a Williams Sonoma cookbook but this time I decided to try a formulation from Chef Michael Mina in San Francisco which notably featured large quantities of buttermilk and lemon zest. Eden’s parents like to entertain. They invited 25 guests to come listen to Eden. 25 servings of dessert are a little hard to make from scratch in an hour…especially if you want to have time before the show to warm up violin fingers. 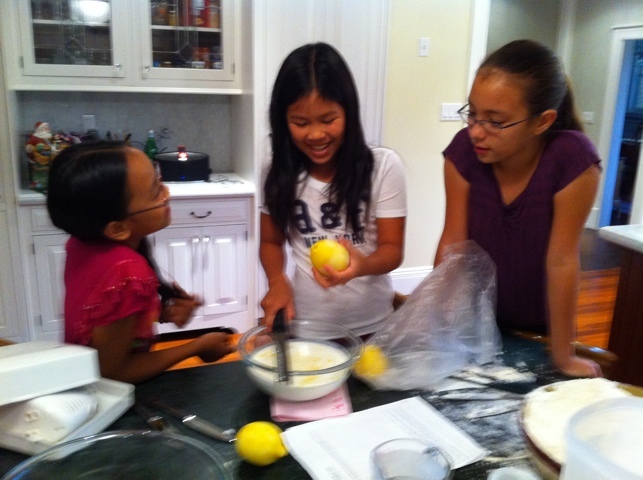 Luckily, Eden had told some of her class mates to come at 5:00 to help with the baking process. They made things go quickly and smoothly. The plan was to bake and cool the biscuits before the recital and let them cool. Then play the concert. Then come back and assemble the fruit biscuits and whipped cream. Everything went according to plan. Eden played brilliantly. Dessert was wonderful. And the big treat for me…Eden’s parents are foodies too and countered my Strawberry Short Cake with a 4 course dinner of Prime Rib, Seafood Curry, An indian inspired rice dish and roasted vegetables. After dinner, there seemed to be a need for more music. So i decided to do a short set of Jazz violin tunes to wind down the evening. An older student of my brother, Anna, happened to be attending that evening. She was inspired to play a little mendelsohn violin concerto to round out the evening. Some days its very good to be a violin teacher.